or other injury to the female genital organs for non-medical reasons. More than 125 million girls and women alive today have been cut. FGM is mostly carried out on young girls, sometime between infancy and age 15. More than 2 million females are cut each year and approximately 6,000 daily. Recognized internationally as a violation of the human rights of girls and women, FGM reflects deep-rooted inequality between the sexes, and constitutes an extreme form of discrimination against women. In certain rural communities across Africa, FGM is considered the norm and is nearly always carried out on minors. The practice of FGM violates a female’s rights to health, security and physical integrity, the right to be free from torture and cruel, inhuman or degrading treatment, as well as the right to life when the practice results in death. FGM occurs in Asia, the Arabian Peninsula, Iraq, occupied Palestinian territories, as well as immigrant communities in Europe, Australia, Canada and the United States. 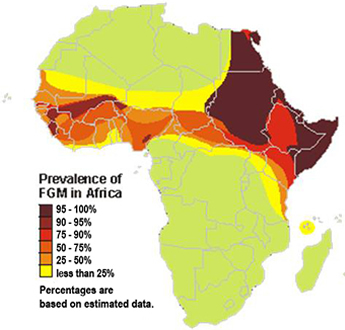 FGM is practiced predominately, however, in the 28 countries that form a band across the heart of Africa.